(Press Release) La Jolla–In the Shadow of White Mountain received a prestigious Emmy award for Best Documentary by the Pacific Southwest Chapter of the National Academy of Television Arts and Sciences. The program’s producer, Rich Wargo of UCSD-TV, accepted the award at the 31st Annual Pacific Southwest Emmy Awards ceremony held on June 18, 2005 at the Omni San Diego Hotel. In addition to the Emmy recognition, “In the Shadow of White Mountain” was recently honored with a “Certificate for Creative Excellence” by the United States International Film and Video Festival’s 38th Annual Awards competition. In early 2005, the documentary received a bronze Telly Award, an international competition honoring outstanding local, regional, and cable TV commercials and programs, as well as the finest video and film productions. Nearly three years in the making and featuring the distinctive voice of narrator Peter Coyote, “In the Shadow of White Mountain” tells the many stories of the White Mountain Research Station (WMRS), a biological field station with both the highest research lab and the highest Internet node in North America. The hour-long documentary includes segments ranging from the extreme hibernation of White Mountain’s squirrels to what the evolution of the Willow Beetle can tell us about climate change. The program was made possible by a grant from the National Science Foundation through its Divisions of Biological Infrastructure and Elementary, Secondary and Informal Science Education. More information about the program, including photos, a look behind-the-scenes of the production, and links to view the program “on-demand,” visit http://www.ucsd.tv/whitemountain. (Press Release) SAN DIEGO–The University of California, San Diego Television (UCSD-TV) documentary In the Shadow of White Mountain was recognized with a “Certificate for Creative Excellence” by the International Film and Video Festival’s 38th Annual Awards competition. Selected from over 1,300 entries from 30 countries, this third place award in the Sciences, Research, and Exploration category is the second for this documentary and its producer, UCSD-TV’s Rich Wargo. In early 2005, the documentary was honored with a bronze Telly Award, an international competition honoring outstanding local, regional, and cable TV commercials and programs, as well as the finest video and film productions. 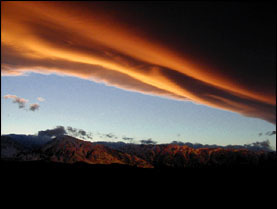 Nearly three years in the making, “In the Shadow of White Mountain” made its television debut in November 2004 on UCSD-TV, the broadcast television station based on the UC San Diego campus, and also aired nationally on University of California Television (UCTV), the UC systemwide satellite channel. Funding for the program was made possible by a grant from the National Science Foundation (NSF) through its Divisions of Biological Infrastructure and Elementary, Secondary and Informal Science Education. Featuring the distinctive voice of narrator Peter Coyote, “In the Shadow of White Mountain” tells the many stories of UC’s White Mountain Research Station (WMRS), a biological field station with both the highest research lab and the highest Internet node in North America. The diversity of research that takes place at WMRS is reflected in the hour-long documentary, which includes segments ranging from the extreme hibernation of White Mountain’s squirrels to what the evolution of the Willow Beetle can tell us about climate change. More information on the program, including exclusive behind the scenes photos, producer’s notes, and links to additional resources, can be found at http://www.ucsd.tv/whitemountain/. (Press Release) LA JOLLA, CA, October 27, 2004–See just what it means to study life on the edge at the University of California’s White Mountain Research Station (WMRS) when In the Shadow of White Mountain makes its television debut Wednesday, November 17 at 8:00PM. The evening’s expedition continues at 9:00PM with programs profiling two sites within the University’s renowned Natural Reserve System (NRS). Viewers who miss the November 17th “White Mountain” premiere can catch repeated airings the following Mondays at 10:00PM and Wednesday at 8:00PM. Each repeat broadcast will be coupled with a new set of NRS profiles, giving viewers an inside look at the work being done to uncover California’s many scientific secrets. Featuring the distinctive voice of narrator Peter Coyote, “In the Shadow of White Mountain” tells the many stories of this unique resource for science, a biological field station with both the highest research lab and the highest Internet node in North America. WMRS provides unprecedented access to a host of environmental conditions, animals, and vegetation, and is yielding a vital understanding of change, from physiology to climate, from the oldest known living organism, to a short-lived beetle, and what this understanding means for all. Nearly three years in the making, “In the Shadow of White Mountain” was produced by UCSD-TV, the broadcast television station based on the UC San Diego campus. 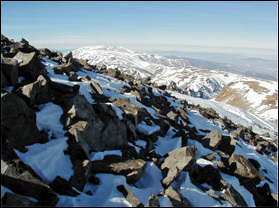 Funding was made possible by a grant from the National Science Foundation (NSF) as part of the organization’s effort to increase public awareness and appreciation of NSF supported science, such as WMRS’ remote monitoring of field data on a real-time basis using the Internet, and a new molecular biology laboratory used for a variety of biological investigations, including the Sierra Bighorn Sheep Recovery program. 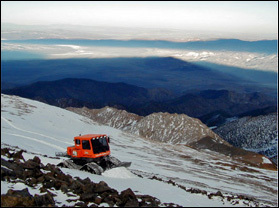 The diversity of research that takes place at WMRS is reflected in the hour-long documentary, which includes segments about the endangered Sierra Nevada Bighorn Sheep; the amazing survival of the ancient Bristlecone Pine Tree; the extreme hibernation of White Mountain’s squirrels; the evolution of the Willow Beetle and what it tells us about climate change; and how extreme altitude effects equines, known for their incredible aerobic performance. For more information on “In the Shadow of White Mountain,” including exclusive behind the scenes photos, producer’s notes, and links to additional resources, visit http://www.ucsd.tv/whitemountain/. 9:00PM Hastings Reserve–Tour this biological field station in the Santa Lucia Mountain range in Monterey County. 9:30PM The Landels-Hill Big Creek Reserve–Situated on the Big Sur Coast, this reserve provides a spectacular location to study nature. 11:00PM James Reserve–Located in Southern California’s San Jacinto Mountains, this reserve uses technology to gain insight into the natural world. 11:30PM Sedgwick Reserve–At this site near Santa Barbara, researchers explore the microorganisms that support California’s ecosystems, and work to preserve the disappearing oak woodlands and restore native grasslands. 9:00PM Coal Oil Point Reserve–This reserve near the UC Santa Barbara campus protects a variety of coastal and estuarine habitats and hosts thousands of visiting migratory birds. 11:00PM Jasper Ridge Preserve–Owned and operated by Stanford University, this Central California site yields studies of the potential effects of global climate change. 11:30PM Hopkins Marine Station–Located on the Monterey Peninsula, this Stanford University-run research and educational facility is the first marine laboratory established on the American Pacific coast (in 1892). The University of California’s Natural Reserve System (NRS) contributes to the understanding and wise management of the Earth and its natural systems by supporting university-level teaching, research, and public service at protected natural areas throughout California. 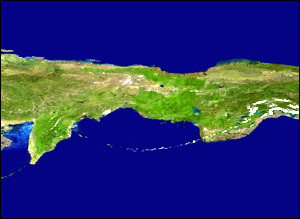 The NRS is the largest university-operated system of natural reserves in the world. Visit http://www.nrs.ucop.edu for more information. (Press Release) Peter Coyote, Emmy Award winning narrator, noted actor, award-winning author (Pushcart Prize; Pushcart Prize Overview) and seasoned environmental advocate recently performed the narration for In the Shadow of White Mountain. “Well it certainly was not a howl, but a very mellow and expertly interpreted reading performance” said Producer / Director Rich Wargo of the recent narration recording for In the Shadow of White Mountain. “…and he did put his heart into it, something rare and precious anytime, but especially in the oft-jaded world of production. He’s definitely one-of-a-kind,” added Wargo. As well as his extensive acting, writing and advocacy, Coyote served on the California State Arts Council, which enjoyed unmatched success during his tenure as director. Well known for his roles (E.T., The Extra-Terrestrial, Erin Brockovich, Cross Creek) as well as his recognizable voice, he has narrated many environmentally-focused productions and takes his commitment to the environment seriously, making hands-on contributions to grass-roots efforts at preservation in many locales, from the Mattole and Salmon Rivers in the north, to the Anza desert. Coyote brought this passion and interest in our world and environmental issues to bear on the narration of In the Shadow of White Mountain, and illuminates this narrative of how science at the White Mountain Research Station continues to help us clearly understand what is happening to our changing world, and what that may mean to our future. Having recently completed the final location taping for the program that included yet another journey to the 14,246′ summit while covering material about a new environmental observatory to be located there, In the Shadow of White Mountain now enters its final phase of post-production. 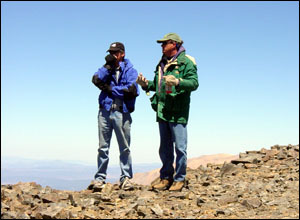 Frank Powell (l), Director of White Mountain Research Station, and Rich Wargo, Producer/Director of In the Shadow of White Mountain discuss the script at the summit. Note the gloves and warm clothing during the first week of August on a calm, clear, sunny day! 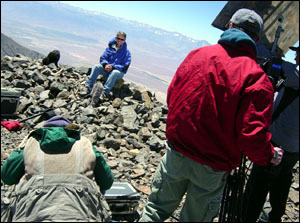 With the Owens Valley and The Sierra Nevada range as a backdrop, Powell is taped by the UCSD-TV crew. 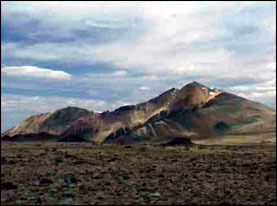 The final weeks of production will include the creation of interpretive graphics and the process of “sweetening” the sound track with music and natural location sound (for an interesting perspective on sound in the White Mountains, see producer’s notes)–and of course the addition of Peter Coyote’s heartfelt narration. A keyframe from an animation test to depict Beringia, better known as the Pleistocene land-bridge that connected North America and Asia during the last ice-age. Working in the White Mountains is extraordinary in a number of ways. Some you can’t avoid, like the demands of working in thin air, and the not-so-subtle effects you experience as you suddenly realize that you aren’t at sea-level. Some experiences are subtle, demanding patient and passive observation, like the incredible silence that you almost don’t notice–but once you do, is almost other-worldly. Other experiences are more assertive with one’s senses. 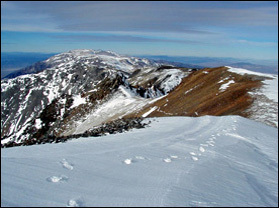 For one, the White Mountains are one of the most visually stunning settings anywhere. The whole ensemble of color, light, shadows and textures seems somehow accentuated. Scuttling clouds create an ever-changing mosaic that flows over the rolling landscape. At the height of midday the sky is a searing blue that darkens to a deep azure zenith set firmly in space. At dusk, the mountains bathe in alpenglow and the sunset reflects off of clouds that seem close enough to touch. Yes, on a clear day, the sky is that blue at the higher altitudes in the White Mountains. When looking at the zenith, you feel like you are looking right into outer space. Another extraordinary aspect of these mountains is the relationship of earth and sky. Except on very rare occasions the thin air here is much more clear than in any more urban setting, making for grand and distant vistas–and one can truly see the dome of the sky set upon an endless horizon. From the summit of White Mountain or some other lofty vantage point, all the world seems below you, and for thousands and thousands of square miles around you much of it actually is. Your vision extends for hundreds of miles, across entire states, and for hundreds of miles you get the impression of a thin slice of earth and a huge arc of sky above, dominating most of what your eyes take in. Hopefully we have captured some of this, and In the Shadow of White Mountain will give viewers a sense of these stunning vistas. But one thing the program will never capture is an equally compelling quality of this special landscape–a sense of its timelessness. 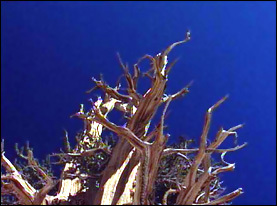 For that you must come and visit one of this environment’s most notable inhabitants, the Bristlecone Pine.